The other courses that would make my top 5 hall of fame include this risotto you see above. It's not from his main menu, and I only got it because I am a vegetarian. 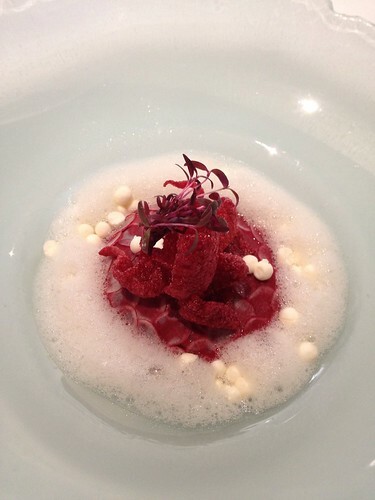 This is beetroot risotto topped with radish carpaccio, some kind of foam and frozen sour cream pellets. The other unlikely candidate to make it to the bestseller list was smoked mushroom jelly with frozen pea like thingies (I am pretty sure they were not actual peas). And rounding up the top 5 list is what I thought was the best course of the day - the black forest gateau. I've read Heston's book where he went in search of the best black forest cake. What came out of that search is a cake with flavors so complex they overwhelm you. Heston also revels in cold and frozen foods (there were plenty of them through the meal) but nothing came close to the kirsch ice cream that was served alonside our black forest. I also need to tell you about the weird and whacky stuff. You've probably heard of sound of the sea already - where they hand you ipod in a shell so you listen to the waves as you eat a course made to look like a beach with sea foam and sand and fish. But even whackier was mad hatter's tea party. Inspired from alice in wonderland, you get served a mock turtle soup, a gold pocket watch that you dunk in the said soup and "toast sandwich" - which is quite literally a toast sandwiched between two other slices of bread. Made very interesting of course, with the addition of truffles and mustard and cucumber. The tasting menu is pricey but the service standards there kind of make up for it. Tons of people hover around you, making you feel special. Every course comes with its own set of instructions and the servers know enough about the food to answer any questions that come to mind. Given how whacky the food is, I certainly had plenty of questions. Once you've finished your meal and are on to coffee, they will even quietly order a taxi to take you to the station. And away from the wonderland. But you still have a copy of the menu and a bag of sweets (the last course that no one ever manages to eat!) to remind you it was not all a dream. OMG,I am getting all worked up, YOU R ONE VERY LUCKY GIRL Sims. GOD, I am speechless..... I want that madhatters tea party NOW..whacky but interesting.How lucky those who dine there. Wow looks like you had a very good experience. He scared the bejesus out of me on Masterchef.